With our private Amphawa Floating Market and Maeklong Railway Market tour from Bangkok, you'll get to taste the essence of local life. Visit Maeklong Railway Market (Umbrella Market) and marvel at how this fresh market along operating train track works. Then we'll eat and shop at Amphawa Floating Market, one of Thailand's most beautiful and liveliest floating markets. Start our private Amphawa Floating Market and Maeklong Railway Market tour at Maeklong Railway Market (Umbrella Market). Enjoy our local lunch at Amphawa Floating Market. 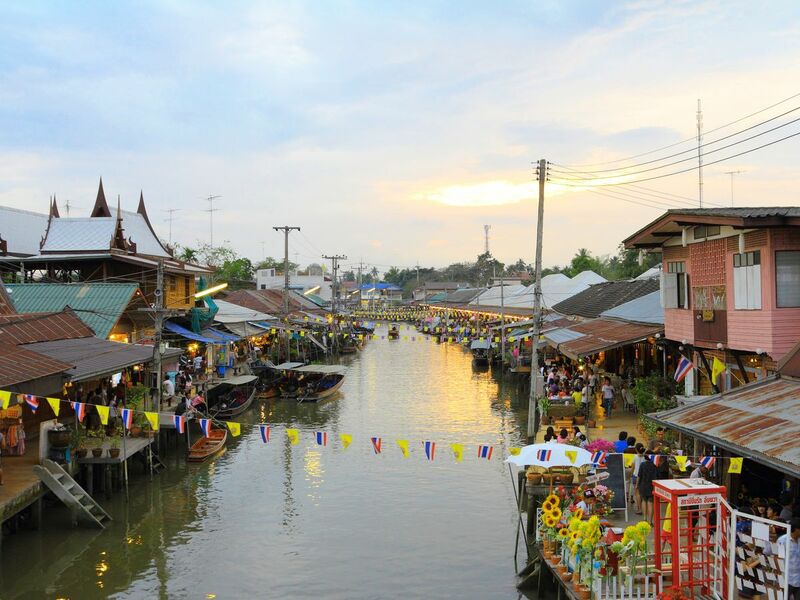 Walk around Amphawa Floating Market and observe the local way of life. Try more tasty food and shop for souvenirs. It's time to go back to Bangkok. Drop you off at your accommodation. Amphawa is a very famous weekend floating market for both Thais and travelers. If this is your first time in Thailand, this is a perfect match for you! Thun is a very nice person. We had a marvelous time and he is patient all the time. When we will be back in Bangkok we will repeat the tour. Thanks a lot, Thun. Everything was perfect. Prayuth provided a tour tailored to our interests and was sensitive to our preferences in regards to the pacing of our adventure. His depth of knowledge of the sites we visited gave us an advantage over other tourists when visiting places like the train market, where he knew where the best photo spots were, and we secured a good location to view the passing train.